- No one may purchase or receive more than five conch from Cayman waters per day. Open Season catch limit - 2 1/2 gallons in the shell or 2 1/2 lbs of processed whelks per person per day. - No one may purchase or receive more than 2 1/2 gallons in the shell or 2 1/1 lbs of processed whelks from Cayman waters in any one day. - Chitons, Periwinkles and Bleeding Teeth may not be taken from Cayman waters at any time. Echinoderms (includes Starfish, Sea Eggs/Urchins, Sea Cucumber, Sand Dollars etc) may not be taken from Cayman waters at any time. 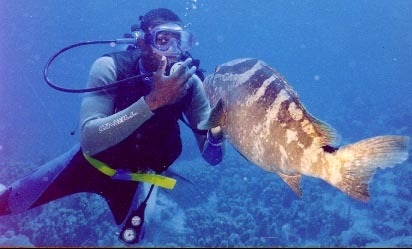 - Designated grouper spawning areas are protected. - During Open Season only line fishing is permitted in these areas by Caymanians. - Size limit - 12 inch minimum size limit applies throughout Cayman waters year round. - Protected - Jew Fish, Tilefish (whities), Filefish (pipers) and Angelfish, including Gray, French and Queen Angels (old monks) may not be taken from Cayman waters at any time. Size limits: Eight inch minimum size on all other fish except Goggle Eyes, Herrings (including Sprats), Anchovies and Silversides (including Loggerhead and Fine Fry). No fish pot may be set within a one-mile radius of any Designated Grouper Spawning Area from November 1 to March 31. No one may use a spear gun (includes Hawaiian Sling, Polespear, Harpoon, Hookstick or any device with a pointed end whcih may be used to impale, stab or pierce any marine life but does not include a striker) or Seine Net without a licence from the Marine Conservation Board. NOTE: A Striker is defined as a wooden pole no shorter than ten feet with a maximum of two barb-less prongs attached to one end. No one may possess a speargun without a licence. Only Caymanians over 18 may be granted a licence. Speargun catch limit 3 fish per licensed person per day. No one may possess more than 6 fish that have been caught by a speargun. No one may spear fish within a one mile radius of any designated grouper spawning area from November 1 through 31 March. Unless licensed by the Marine Conservation Board, residents who do not possess Caymanian status may not take or attempt to take by any means any marine life while he is on shore or in any part of Cayman waters in which he can stand. No licence is required for catch and release fishing. - The export of conch shells and/or black coral requires a CITES permit issued through the DOE. Violation of any of these laws is an offence carrying a maximum penalty of CI$500,000 fine and one year in jail. Upon conviction forfeiture of the vessel or other equipment may also be ordered. Call for further informaton Department of Environment, 580 North Sound Way, Grand Cayman. Phone 949-8469 Fax 949-4020; Cayman Brac Phone 926-0136, Little Cayman Phone 926-0135; VHF Channel 17.